I'm new to designing and i despair on a (i suppose) simple task. I try to create a graffiti and have issues with overlapping letters/shapes with shadows. I need a small hint how "one" would do that. I attached a sample which should show my problem. 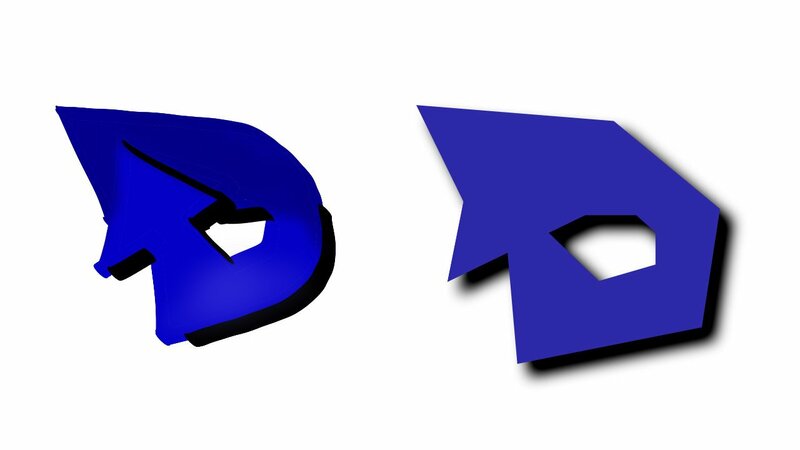 Left is a hand-drawn sketch what i try to achieve: A letter "D" with an arrow which drops its shadow to the rest of the shape with a gradation from light blue to dark blue. 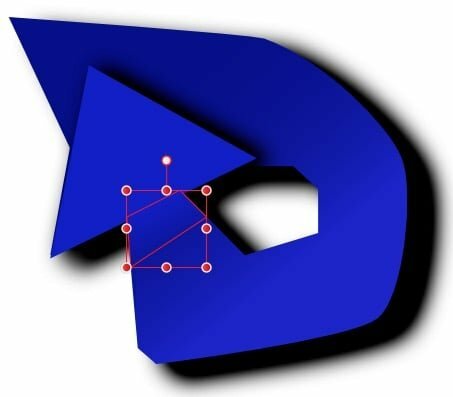 There is probably a better way to do this (& a better execution of this way), but what I did in this Ebene1.afdesign file was to cover the base of the arrowhead shape with a small patch & match (more or less) its gradient to the gradient of the surrounding area. So that means i have to precisely match the gradient of the patch? Is it even possible to be done perfectly? And the size of the arrow shaft? I use the boolean operations to "cut out" a perfectly sized patch-shape? Yeah, the hard part is perfectly matching the gradient for the patch. Making it no larger than is needed to cover the shadow cast by the arrowhead onto the shaft makes it somewhat easier. Getting the angle of the linear patch gradient the same as for the shaft is important -- I didn't really try to do that but one way would be to create a pair of temporary lines to use as a guide since I don't think there is any way to set the angle numerically. As for creating the patch shape, I just drew it with the Pen Tool using snapping to set the size to the width of the shaft & its height to the intersection with the arrowhead shape, & then moved the two top nodes upward slightly one at a time, using the edges of the shaft below as a guide to make sure everything stayed aligned. It is harder to describe than it is to do, but if you experiment a bit, particularly at high zoom levels, I think you will get what I mean. I came at it in a slightly different way. I took a base shape, duplicated it a couple of times, and applied color gradients and transparency fades. It is a bit fussier than one might like to do. I realize that illustrating the hand-drawn sketch needs a re-thinking on my side. Thanks for your explanation. It's helping me. Thanks. I have to try that too. It looks promising and doesn't need so much positioning of extra shapes (i guess). 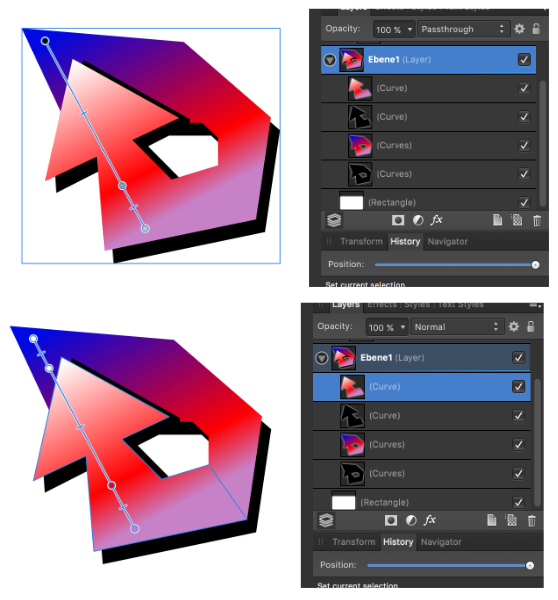 To take the guess work out of matching up gradients use it on the group or layer. That way each element inside will have the exact same gradient fill to start (as opposed to copy > paste style. That won't work here). Then just tweak the nodes on individual objects. What you don't touch will continue to match up perfectly. Made the master gradient on the parent Layer. Changed the top node (and added a second a little lower) just to the arrow. Changed the shadows to black. So.... the bottom two nodes never change and the transition from arrow to the D shape is seamless. Thanks @JimmyJack. That's a very nice solution. One further question though: If i change the gradient of the group/parent layer, i change the gradient of the black shadows again. Meaning, i have to set them back to black again every time? Yeah, changing the master/parent will cascade to what's below. One of the drawbacks of a stack system. This allows a (nearly?) seamless gradient along that edge, which otherwise might be very difficult to achieve. That angle has no bearing on the "shared" gradient. 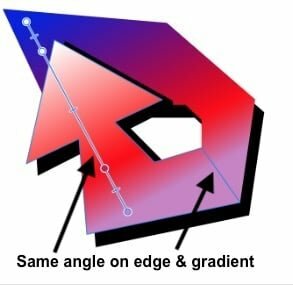 That angle has no bearing on the shared gradient. Yes, you are right about that but what I meant is your solution involves a different arrow arrow shape than the one @Cloonix used in the OP. Thanks to the different ways of solving my problem, I've learned a few new things. Thanks.